The BBC’s Third Programme began broadcasting (evenings only!) on September 29, 1946 – so a 70th birthday looms. In September 1967, it was renamed Radio 3 when the Corporation re-branded its radio channels and, since then, it has become an integral part of the nation’s cultural life (and widely followed, and envied, internationally). We’re making this award – while acknowledging and rewarding the network’s 24-hour, seven-day-a-week contribution to our daily routine – for Radio 3’s extraordinary role in the musical fabric of this country. No other organisation, anywhere in the world, has delivered so wholeheartedly the BBC’s first Director General Lord Reith’s three-word challenge; ‘to inform, educate and entertain’ (goals still enshrined in the Corporation’s current mission statement and which have been influential on broadcasters throughout the world, America’s PBS among them). But Radio 3 went a lot further: in its 70 years it has commissioned thousands of pieces of classical music and given them their first performances and broadcasts; it has supported many generations of young artists (notably in the past 17 years through its New Generation Artists scheme) and, through its performing groups (the BBC SO, the BBC Concert Orchestra, the BBC National Orchestra of Wales, the BBC Philharmonic and BBC Scottish SO, the BBC Singers and, partly funded by the BBC, the Ulster Orchestra), has been an integral part of the foundation of the whole nation’s musical life. 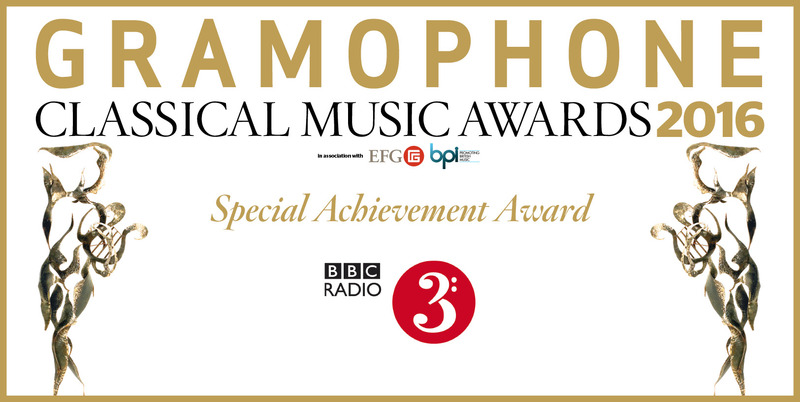 Looking back through the list of Gramophone Award winners sees plentiful representation of those orchestras funded and administered by the station: Luciano Berio and the BBC SO (1977), Boulez and the BBC SO (1983-4), Andrew Davis conducting Tippett’s The Mask of Time (1987), a historic recording of Webern conducting the BBC SO in Berg (1991), Nikolai Demidenko playing Medtner piano concertos with the BBC Scottish SO (1992), Jerzy Maksymiuk conducting the BBC Scottish SO in MacMillan (1993), Tortelier conducting Dutilleux with the BBC Phil (1994), Knussen conducting the BBC SO in Robin Holloway (1994), Tortelier conducting the BBC Phil in Boulanger (2000), Knussen conducting the BBC SO in Elliott Carter (2000), Bax symphonies from Vernon Handley and the BBC Phil (2004), Stanford orchestral songs from the BBC NOW and Richard Hickox (2006), Knussen and the BBC SO in music by Julian Anderson (2007), Jiři Bělohlávek conducting the BBC SO in Janáček (2008), Ilan Volkov and the BBC Scottish SO in music by Jonathan Harvey (2008) and by Britten (2009), Tortelier conducting the BBC SO in French concertante piano works (2011), Bělohlávek and the BBC SO in Martinů symphonies (2012) and Suk orchestral works (2013), Prokofiev piano concertos with the BBC Phil (2014) and, last year, Elgar’s The Dream of Gerontius with the BBC SO conducted by Sir Andrew Davis. So many artists received their first musical exposure thanks to the BBC: Peter Pears and Sarah Connolly were both members of the BBC Singers; Janet Baker, just a few weeks after joining the Ambrosian Singers, was granted a BBC Northern Home Service recital of songs by Brahms and Elgar, to name but three of the (subsequently) most high-profile. The New Generation Artist scheme, launched in 1999, has fed an extraordinary number of musicians into our world – the Gramophone Awards have recognised the talents of Steven Osborne, Paul Lewis, the Belcea Quartet, Alexander Melnikov, Jonathan Lemalu, Simon Trpčeski, Alison Balsom, the Quatuor Ebène, the Pavel Haas Quartet (five times! ), Mahan Esfahani, Benjamin Grosvenor, Igor Levit and Benjamin Appl. The last two of those are among this year’s winners. It is impossible to gauge how much music the BBC has commissioned or premiered but, speeding past the British premiere of Berg’s Wozzeck or world premiere of Vaughan Williams’s Symphony No 4 (1935), the list of commissions is astounding. From Elgar’s (undelivered) Third Symphony (commissioned in 1932), the list contains Walton’s Crown Imperial (1937) and Troilus and Cressida (1954), Poulenc’s Sinfonietta (1948), Bliss’s Violin Concerto (1955), Tippett’s Second Symphony (1958), Vision of St Augustine (1966) and New Year (1990), Lennox Berkeley’s Second Symphony (1959), Arnold’s Fourth Symphony (1960), Britten’s Owen Wingrave (1971), Boulez’s Rituel (1975), Schnittke’s Second Symphony (1980), Giles Swain’s Cry (1980), Birtwistle’s Earth Dances (1986), Maw’s Odyssey (1987), Elliott Carter’s Anniversary (1989), Holmboe’s Symphony No 12 (1989), Turnage’s Your Rockaby (1994), and two works by John Tavener that might perhaps be described as modern repertoire pieces: The Protecting Veil (1989) and Song for Athene (1994). The list is endless. This year’s Proms season alone witnessed new commissions from Anthony Payne, Michael Berkleley, Lera Auerbach, Helen Grime, Malcolm Hayes, Huw Watkins, Charlotte Bray, Mica Levi, David Sawer, Piers Hellawell, Emily Howard, Sally Beamish, Bayan Northcott, Julian Anderson and Tom Harrold. Of course, we can’t ignore the hours of live music-making – concerts and operas beamed from venues up and down the country, as well as from opera-houses and festivals around the world, not to mention what is simply the world’s greatest music festival, the BBC Proms. Nor the magazine programme Music Matters (and for those of us with longer memories, the wonderfully urbane Michael Oliver’s Music Weekly). Gramophone and Radio 3 come closest on a Saturday morning – not only sharing many contributors, but both exploring the wonders of the recorded catalogue. Building a Library is, quite simply, an institution. Then there’s Choral Evensong, the lunchtime concerts (once from St John’s Smith Square and St George’s, Brandon Hill, Bristol and now from London’s Wigmore Hall). And that constantly fascinating weekly series, Donald Macleod’s Composer of the Week.